The energy of Las Vegas was clearly evident at this year’s ILTA conference! Touting a record number of attendees, both the exhibit hall and sessions were filled with individuals eager to learn and to absorb all that ILTA has to offer. Our own booth, #427, saw lots of activity with us seeing old friends and making new. Fellow partner, David Little of Contentworker, also joined us and assisted in presenting SharePoint solutions. 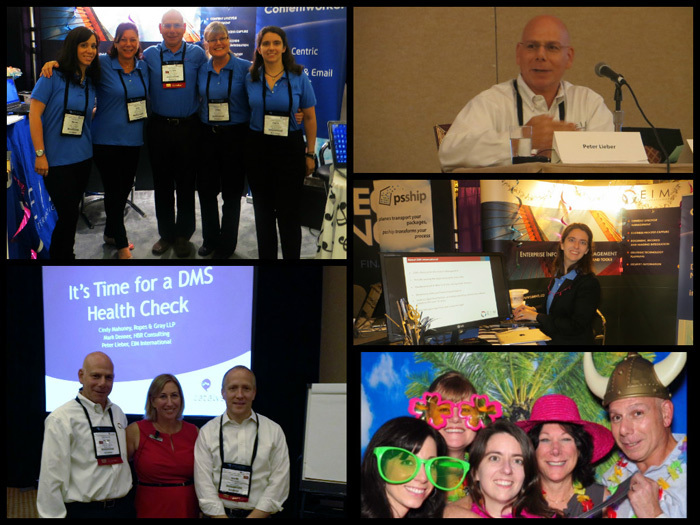 EIM’s President, Peter Lieber, was once again invited to speak as part of a panel during the session “It’s Time for a DMS Health Check”. What made this session so interesting was after an excellent moderator (Cindy Mahoney, Ropes & Gray) skillfully guided the panel members through various scenarios and checkpoints, the room then divided up into working subgroups. Peter, Faith Drewry (EIM’s Director of Consulting Services), and Craig Valera (a very seasoned OpenText Solutions Consultant) led a highly technical OpenText-focused best practices discussion. Great information; great networking!